Print your logo onto these custom printed hawaii beach towels or one of our other innovative towels and use them in your next marketing campaign as a unique giveaway item. Custom printed striped promotional towel ideal for beach or summer related promotions. 430 gm2 Terry towel made of 100% cotton yarn that has been dyed. Print or embroidered or do a soft velvet print (at an extra cost). Prices shown includes 1 Colour embroidery (3 x 4cm), in 1 position. 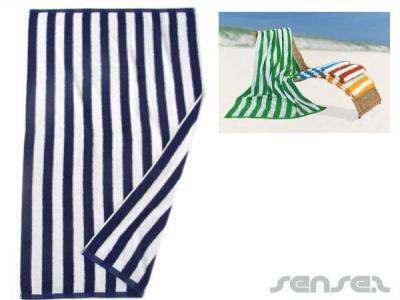 Other innovative corporate gift ideas that could be suitable to create brand awareness include these cheap promotional Large BeachTowels, quirky advertising gifts such as these Plush Striped Beach Towels (450gsm) or how about using one of our more bespoke custom made products such as these great quality Cheap Striped Towels? Custom brand these large beachtowels or one of our best-selling promotional towels with your company logo! We can embroider the promotional hawaii beach towels with your company logo. The exact cost of the embroidery will depend on how large the embroidered area of your logo is. Sometimes logos are too detailed to enable us to effectively embroider them onto the hawaii beach towels, as the stitching will simplify your logo so that any fine detail will be lost or can simply not be achieved. Your promotional hawaii beach towels can be silk screen printed in 1 or more colours. Costs shown include a 1 colour logo print on your custom branded hawaii beach towels. We can print more than 1 colour, however it incurs extra costs. We can achieve a perfect PMS colour match for the print. 4 colour process print is like a photographic print, where you can see a lot of detail and shading as part of your design. When we print your promotional hawaii beach towels in full colour process we usually do this as a digital print. The colour match is quite good but is never quite such a perfect PMS colour match as is achieved by silkscreen print. Personalise your hawaii beach towels or custom design towels for your marketing campaign. How can these unique promotional hawaii beach towels or our personalised towels fit in with your marketing strategy and help you maximise your brand exposure? Our custom made Hawaii Beach Towels can be produced from a minimum quantity of 50 pieces. We can have your logo branded on these corporate Hawaii Beach Towels. A setup fee of AU$180.00 will apply to make the film.